READING’S first airport to be managed by a company chartered for commercial flying was Whander Field. The chartered company was Reading Airways, which was also the first company in Pennsylvania to receive a charter for commercial flying. Judge Richardson, who made the application, is a member of the present Reading Airport Commission. Since the application for charter by Reading Airways was the first to be made in the state, the question arose at Harrisburg whether or not the charter would have to be approved by the Public Service Commission. Numerous hearings were held, and on December 6, 1927, an application was made to the Public Service Commission. The Commission decided that its approval was necessary in such cases, thus establishing a precedent for the state, and William D. B. Ainey, chairman of the Commission, filed a report stating that the application was approved. On December 20, 1927, the charter was signed by Governor John S. Fisher, and Reading Airways was officially born. In the petition Allen K. Owen stated that he had purchased three airplanes from Pitcairn Aviation, Inc., of Philadelphia. The planes, he said, were manufactured in April and September of 1927 and were powered by Curtiss-Ox-5 engines of 100-horsepower each, known as “Willy’s- Morrow” engines. Two of the planes were Pitcairn Pa.-3’s, and one was a Pitcairn Pa.-4. They were all biplanes. Owen also stated in the petition that he had spent $7,000 in the erection of a hangar, and that the Aviation Committee of the Reading Chamber of Commerce was active in encouraging the enterprise, and that the city of Reading had by ordinance provided for an Airport Commission. 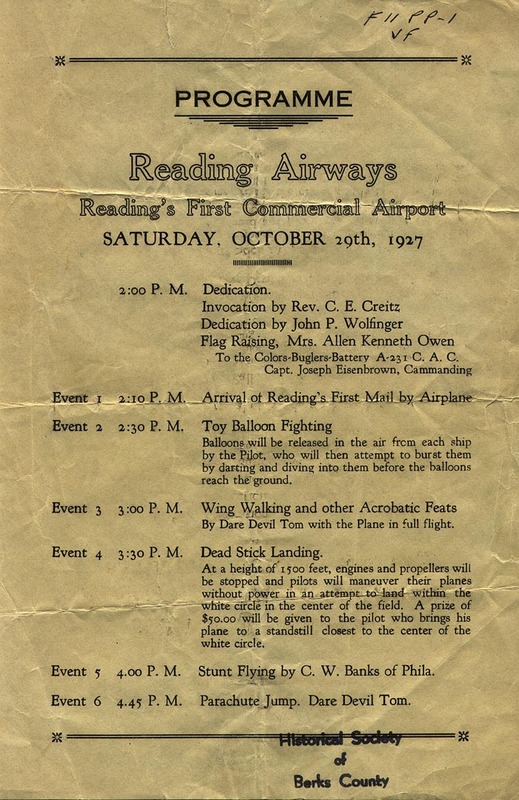 That there was interest in aviation in Reading and Berks County was indicated in the operating statement of Reading Airways for the two-month period from June 1, 1928, to July 31, 1928. During that period the gross revenue from airplane operations amounted to $3,844.83. This revenue, according to the statement, came from 539 sightseeing flights, special flights, long-distance flights, student courses and miscellaneous instruction. The following year, however, there were changes of names and ownerships. Curtiss Airports Corporation was at that time interested in the purchasing and operating of various flying fields and companies. Thus it was that Reading Airways sold its charter to Curtiss Airports Corporation, and Reading Airways came to be known as Eastern Air Transport, Inc. Then on December 7, 1929, Eastern Air Transport sold its assets at Whander Field to William P. Ham and Adam J. Spatz. Because the old Reading Airways name had disappeared when it was changed to Eastern Air Transport, it was possible for the new company to receive a charter under the name of Reading Airways. The charter was received early in 1930. Meanwhile, Eastern Air Transport had transferred its sphere of operation from Whander Field to the Atlantic Coast regions. 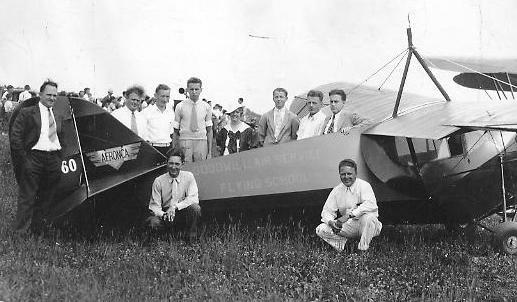 Some years later the operation of Whander Field was taken over by Richard C. Estler and Brooks McElroy, both of whom are now associated with Reading Municipal Airport as hangar-repair shop concessionaire and flying concessionaire respectively. Whander Field was not the first flying field in this region, however. One of the very first was Madeira Flying Field in Hyde Park. Situated along the Temple pike, the field was host to many visiting airmen. After a number of years the field was enlarged, hangars were erected and other improvements carried out. With the arrival in Reading of Eddie Nibur, an excellent aviator of considerable experience, Madeira Field ceased being just a barnstormer’s haven and became a commercial port for chartered flights and student instruction. This field is still in operation, its services having recently been increased by the addition of a new plane. The Berks Airport, situated in Bern township a short distance beyond Reading Municipal Airport, was laid out by a group of local flyers a little more than a year ago. Other fields, no longer used for flying purposes, but which were very popular in the 1920’s, were the County Home field near Shillington, and a field in the Eighteenth Ward, not far from the Bingaman street bridge and to the north of Lancaster avenue. Both these fields were visited frequently by the hosts of barnstormers who toured the country in the years following the close of the World War. The war had awakened the layman to the thrills of flying, and people enjoyed sight-seeing flights over the countryside, and the more daring paid a few dollars extra to loop- the-loop. The prices of those early flights were, in the light of present-day charges, exorbitant. It is possible today to fly from Reading to New York for the amount of money charged in the 1920’s for a two-minute spin over the city. Yet, the people gladly paid and they went home to tell their relatives and friends what a thrilling time they had had. 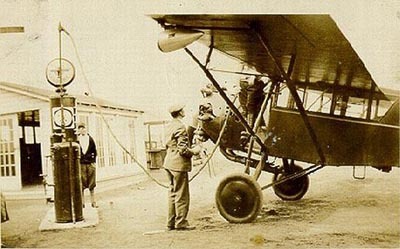 The airplane of the 1920’s was an amusement machine for thrill-seekers. The airplane of the 1940’s is an established means of safe, comfortable, rapid transportation used by persons who might shudder at the thought of going for a ride on a roller coaster.